Lots of people wonder about the things that can go wrong with a typical re-roofing project. Aside from the funny roofing stories, there are some mistakes that I see over and over again when I’m out with my employees doing a visual inspection after we’ve torn off the old roof. The good news, is that we’ll make sure your roof is impeccable, and that 20 years from now it still holds its value. One of the biggest issues we run into is the ice and water shield. Lots of people only put one line. You need two on most homes. On larger homes or custom-made homes, you can use three or four sheets of ice and water shield to make sure it’s going to be effective and protect the home. An ice and water shield are a self-adhering membrane. It’s sticky. You roll it down directly on the oriented strand board (OSB) or the plywood, and it seals to it. Then you put your paper underlayment down. The idea is that it allows the ice to back up. It’s a pretty powerful construction technique, and many people just do the bare minimum instead of going the extra mile to make sure it’s going to prevent ice from damming up. Another thing we run into relates to blow offs from a roof. Wind storms can cause quite a bit of damage to improperly nailed roofs because the shingles aren’t securely nailed in place. We call it a high nail. It’s usually the result of a roofer moving too fast with too little attention to the details. Sometimes people will nail on the asphalt strip instead of below the asphalt strip, but that’s usually the case when someone hasn’t been trained properly. They can sometime think that the extra tar will seal around the head of the nail, and that just isn’t the case. Overdriven nails, too, can be a problem especially with pneumatic guns with settings that haven’t been calibrated. 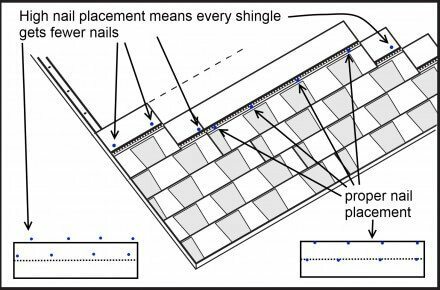 When nails are overdriven, they punch through the mat of the roof and are far more likely to slide up and fly off during a windstorm. What About the Utah Roofing Industry? The roofing industry is still a word-of-mouth industry. That’s why we care so much about doing quality work the first time because your roof really is our roof. It’s our name that’s behind it. And when people ask you where you got your roof done we want you to be able to say “Rock Solid Roofing did my roof.” We know roofs are unexpected expenses for most people. We know they’re expensive. Consequently, we make sure that you’re getting the highest-quality roof your money can buy. The other day one of my sales guys was driving by a home we’d done and noticed some shingles had blown off during a storm. It happens. But that’s our name on the line, that’s our roof we built. We take pride in that. So, my sales guy just called me up and said, “Hey, I sent so-and-so over to fix up their roof so they’ll be a little late to our staff meeting,” and I was just proud that our sales guy cares that much about our reputation that he’d go and do the right thing. That’s the kind of company I’ve built, and I’m proud of the work we do. We take care of our customers because that’s the way we’d like to be treated, too. When we say, “Your Roof is Our Roof” we mean it.